We are proud that this organic fennel root is carefully curated from, and packed in, Cleveland, OH. We are a local company that employs local workers to help package, prepare, and inspect our tea so that every batch you receive is of the highest possible quality! 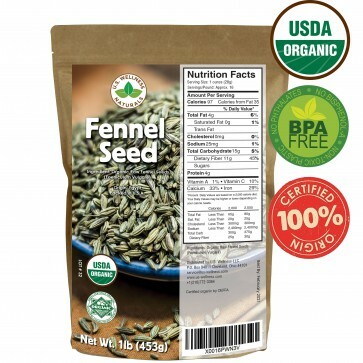 This organic fennel seed makes for healthy snack or food additive. It comes in a HUGE one pound bag so you’ll have fennel available for whenever you need it. Being a certified organic product, the fennel seed from US Wellness is free of contaminants. This means you get truly raw fennel seeds for your recipes or to hit the spot during afternoon hunger pangs. In addition to snacking and cooking, fennel has numerous benefitial porperties. It has been used for ages as a homeopathic remedy for several different ailments. Many people claim that fennel seed and fennel tea help with indigestion, bloating, menstrual pain, and even gingivitis. Fennel has many uses in day to day life. It is a fun alternative in cooking, and can be used as an additive. It also makes a tasty and healthy organic tea. 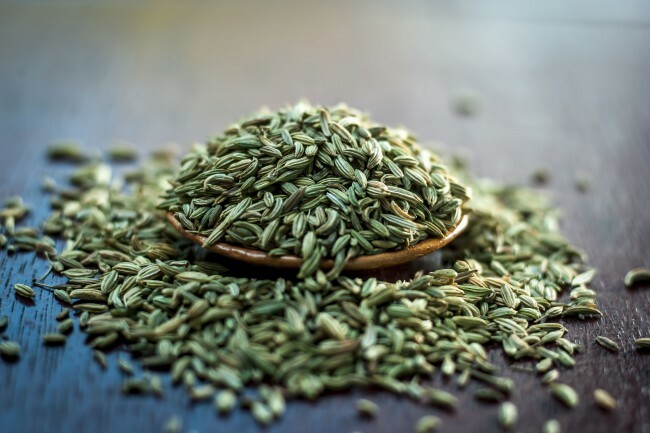 Simply place a couple tablespoons of fennel seed in your tea infuser and brew for a delicious cup of tea. It may come as a surprise that fennel is a member of the carrot family. It is a perennial, meaning it sprouts annually, with a beautiful yellow flower. Fennel is native to the Mediterranean. 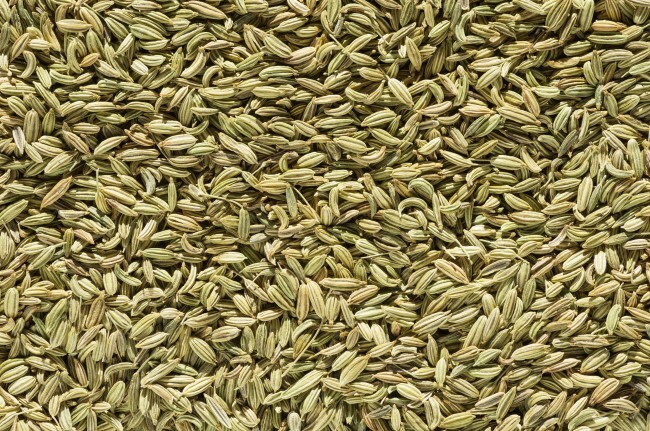 It is from the ancient fertile crescent that U.S. Wellness has sources our organic fennel seed. Bearing the organic label comes with great responsibility: it means the fennel was sourced by strict standards, free of pesticides and other harmful chemicals. This becomes infinitely more important with a product that can be consumed raw like fennel seeds. These seeds are technically the fruit of the fennel plant. It has a beautiful aroma and is used for snacks, tea, or even a spice. It comes packed full of protein, fiber, and B Vitamin, making it an excellent source of energy. 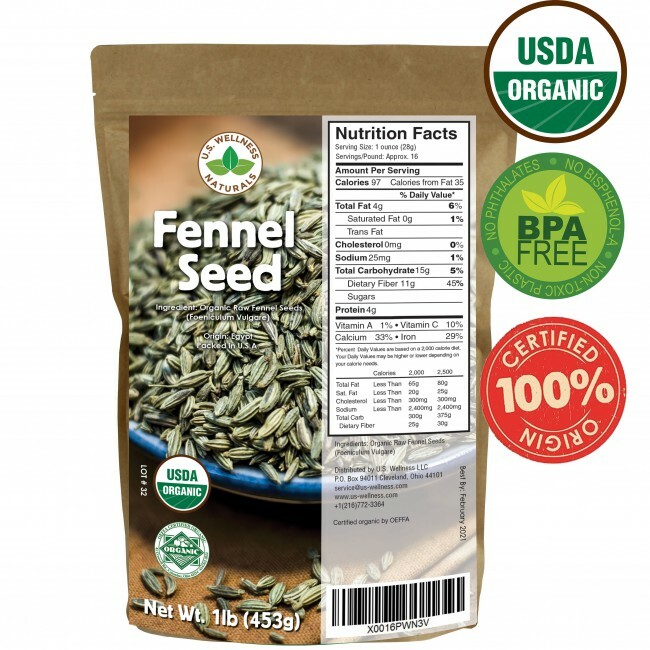 Fennel is considered a superfood, and this one pound bag will help make “super-you.” With the energy and potential health benefits in this all natural food, this 1 lb bag of fennel may not last too long after all! This information has not been evaluated by the Food and Drug Administration. This information is not intended to diagnose, treat, cure, or prevent any disease. Please be advised: you should always consult with your doctor before making any changes to your diet. U.S. Wellness LLC In Japanese Market! We are happy to announce that we have established an exclusive distributor relationship with Joyfay International LLC (http://www.joyfay.com) who currently carry exclusive distributor rights of U.S. Wellness LLC products for market of Japan. That includes exclusive rights to distribute on http://www.amazon.co.jp, http://www.rakuten.co.jp and all available retail locations across Japan. Working directly with the farmers to bring you the best quality. Chemical and phytopathological testing with origin certificates. A wellness blog to share experiences about our products. Available for wholesale. Please contact us. © 2016 U.S. Wellness LLC Online Store. All Rights Reserved.